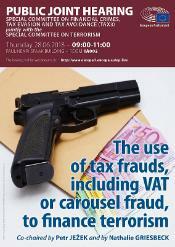 TAX3 and TERR Special Committees will hold a joint public hearing on “The use of tax frauds – including VAT or carousel fraud – to finance terrorism" on 28 June 2018. Tax fraudsters move money from the white market to the shadow/black market including via VAT carousel frauds which can be run at a small low-cost-scale. Various investigations and studies have shown that VAT fraud is used to channel profits towards terrorism activities. Carousel fraud itself is not a recent development, however the current VAT features (namely self-assessment) are taken advantage of to establish a network of shell companies that result in VAT not being paid. Enforcement and cooperation are key to tackle this source of financing terrorism. They face particular challenges that need to be understood and addressed.